I have worked in various small businesses and non-profits where I was responsible for marketing and content creation. Currently, I manage marketing and digital communications for a software company in Seattle. My goal is to continue to learn how to help companies grow through organizational storytelling that connects with target audiences and meets business goals. I am constantly applying lectures and class discussions to my daily responsibilities at work. The final project in my very first Comm Lead class was repurposed into a blog post for my company that we now send to new customers. The content of my classes has been timely and relevant to what businesses are talking about, which has positioned me as a strong contributor to these discussions. Taking classes part-time, while working full-time seems to be just the right balance to feel productive at work and challenged by grad school. Work happens from 9-5 and schoolwork is done on weekends and nights—sometimes late nights. It’s a lot of work, no question. But it’s the type of work you are motivated to do more of. I am fairly early in my course map right now, but I would say the two foundations classes in the Fall and Winter quarters had the most impact on me personally. They both emphasized areas for us to ‘up our game’ and approach challenges differently throughout the rest of the program and our careers. The supportive community that we built during those two first classes was really empowering. 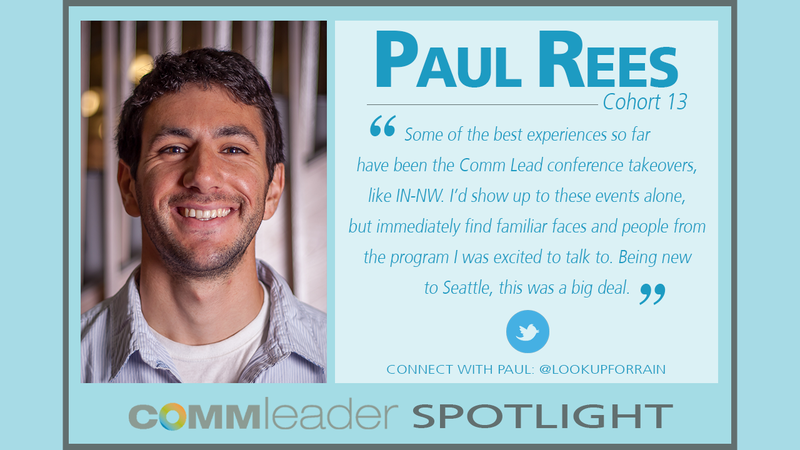 Aside from the typical experiences you would expect from the program (great classes, challenging peers, intelligent professors), some of the best experiences so far have been the Comm Lead conference takeovers (like SIC or INNW). I’d show up to these events alone, but immediately find groups of familiar faces and people from the program I was excited to talk to. Being new to Seattle, this was a big deal. I want to lead innovative digital strategy campaigns that break rules and achieve unprecedented results. I’ve been reading a lot about how businesses and startups have been finding success by rejecting traditional rules of building a business. There is definitely a place for tried and true methods and frameworks, but it’s really interesting to read how entrepreneurs are being successful using digital tools to break some of those rules. I feel like the answer to this question needs to be octopus. But I’ve never had octopus, so I’m not sure what the answer is.